Mitta Mitta, a small rural township in north-east Victoria, is on the Omeo Highway about midway between Wodonga and Omeo. It is also on the Mitta Mitta River, where the highway joins the Mitta Mitta valley on its way northwards. In 1837 pastoralists from New South Wales reached the valley and took up the Mitta Mitta pastoral run. They extended the run further south in 1842. It is thought that the name was derived from an Aboriginal expression describing a small area of water or a place where reeds grow. As well as being situated at the junction of the Omeo Highway and the river valley, Mitta Mitta is also positioned where the Snowy Creek enters the river. The Mitta Mitta River and its tributaries had been intermittently prospected for gold since 1852, and in 1858 the Snowy Creek was rushed and a gold field was established. Fresh fields were found during the early 1860s. The junction of the Snowy Creek and the river is one of the few wide parts of the river valley upstream suitable for agriculture, and its coinciding with a gold mining locality was fortunate. In 1865 township allotments were surveyed and sold, and in 1869 the Snowy Creek school was opened. 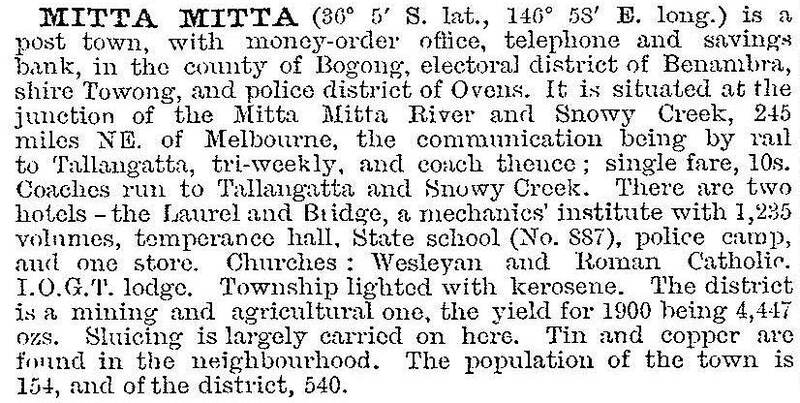 Its named was changed to Mitta Mitta in 1880. Mitta Mitta’s largest gold field was The Pioneer (1864), about 1 km south-west of the township. Water races were cut for gold sluicing, and The Pioneer continued until 1904. Further south, at Lightning Creek, a giant flume was built to carry sluicing water to Granite Flat. Across a ravine, the supporting timber structure was 230 metres long and 35 metres high. Its owner, the Mammoth Hydraulic Gold Mining Company, gained only meagre returns on its investment (c1886). During the 1920s the Victorian municipal directory recorded the continuation of mining, the operation of sawmills and the presence of alluviums over 30 metres thick, swept into the valley by hydraulic sluicing. In 1933 the directory recorded the establishment of tennis and recreation facilities in the town, along with a good camping ground favoured by tourists and summer picnic parties. There was also a livestock saleyard. Until the 1990s the Omeo Highway was largely unsealed between Omeo and Mitta Mitta. Over half the unsealed section was upgraded during that decade, improving its prospects as a tourist route.